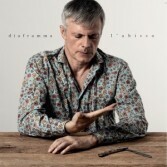 "L'abisso" is the new album of Diaframma by Federico Fiumani, due out on December 7, 2018 via Diaframma Records. "The abyss, because I will end up within a year and a half, since I will be 60 years old," comments Fiumani, "I will officially enter into old age, an abyss from which one no longer comes out. And then the abyss is where in my opinion the West is sinking, more and more slave and at the service of technology and economic power ".